For their own safety, as well as the safety of their owners, dogs should wear a harness when they are being walked. If your dog is prone to escaping from the harness you currently use then you need an alternative. We recommend that you make sure your dog's new harness won't cause it neck injuries when you pull it pulled back. To help you choose the right harness for your pup we are going to review five of the best escape proof dog harnesses currently on the market. Question 1: How do I put a dog harness on my dog? Question 2: What is a dog harness used for? Question 3: How do I tighten a dog harness? Question 4: Can I use an escape proof harness to help train a puppy? Question 5: Will my dog get too hot wearing a harness? This looks and works differently than the other escape proof harnesses we'll look at but that doesn't mean it is any less effective. 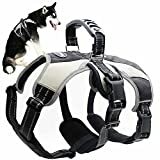 This harness has very positive reviews from hundreds of dog owners, especially in respect to how well it helps them keep their dog from pulling too hard. Dogs come in all shapes and sizes and one of the most important aspects of using any harness is getting the right fit for your dog. Because of how the Harness Lead Escape Resistant Dog Harness has been designed, it can be adjusted to fit not only any size of dog, but any shape, too. This means if your dog is skinny, fat, or somewhere in between, this harness will fit well. Whilst being able to fit properly makes a harness comfortable for your dog, the Harness Lead Escape Resistant Harness is made of soft textured material which is also comfortable for dogs. Hard or coarse textures can cause chafing which can create irritation on your dog’s skin. This escape proof dog harness has doesn't have hard edges on any of the parts so there is lower risk of irritation to your pup. Buckles are often guilty of scratching and irritating a dog’s skin. You won't run into that issue with this harness--there are no buckles attached to this harness. One of the top benefits of this harness is its ability to help stop your dog from pulling. If your dog tries to pull, the harness will tighten around its torso (instead of its neck). The dog will sense this and back off. The tightening is not harmful in any way and it is much safer than a neck collar, or choke chain. With a tensile strength of 3700 lbs., no dog should be able to snap it either. The tightening effect is very effective at preventing dogs from escaping whilst they are being walked. It is very difficult for dogs to wriggle out of the harness. Some dog owners have commented on how long it takes to put this harness on and we agree that if your dog is excited and keen to go out, it may take longer than simply clipping a lead to their collar. This is an ideal escape proof dog harness for training puppies and any dog that needs training, plus it is extremely comfortable for your dog to wear while being walked. This is because the materials used to make the harness are not only soft but breathable too. Ensuring that your dog is comfortable when out walking is not only beneficial to them but from your point of view, it means there is less likelihood of them wanting to escape from the harness because of their discomfort. The first feature which contributes to your dog's comfort is the soft padding in both the belly and chest areas. These help to reduce friction between the dog's skin and the harness, decreasing irritability. The material lightweight and perhaps more importantly, it has breathable mesh on the inside. This helps to reduce heat from building up close to your dog's skin and negates any danger of them overheating and the problems that can cause. To help you control your dog when going for a walk, there are not one, but two attachment points for leashes. This allows you to either use one in the most effective position or if necessary use two leashes for control over larger or more energetic dogs. There is also a padded handle on the back of the harness which can be used to hold back your dog if the need arises to restrain them. With one of the main reasons for using an escape proof harness being safety, it should come as no surprise that this Scenereal harness has reflective areas that allow your dog to be seen at night. It is a sad fact that many harnesses designed to be escape-free are the opposite because they are so uncomfortable due to the chafing they cause. Thankfully, this harness is extremely comfortable for your dog, so they should love wearing it. The materials on this harness tend to stretch over time, so you may find yourself having to adjust the straps more often than you might expect, to ensure it continues to fit your dog properly. The Mihachi dog harness is one which provides a safe and secure means for you to walk and train your dog. It has soft edges, so they will feel comfortable wearing it and do so for many years, thanks to the harness's durable and washable materials. The key to any harness being effective in terms of your dog walking as they should, and not trying to escape from it, is how comfortable they feel when it is being worn. One of the best ways for this to happen is the harness fitting properly and being neither too tight nor too loose. With 5 different points of adjustment throughout this harness, you can make sure that it fits your dog perfectly. Not only will this achieve the comfort we mentioned, it will also give your dog the maximum range of motion so that they can walk without any hindrance or restriction. Staying with the comfort theme, we also have features which ensure there is no painful chafing or rubbing when wearing the harness. Foam padding on the front support and soft edges should mean no irritation or pain for your dog, no matter how long they wear the harness. Your dog's well-being, and indeed yours, is further enhanced by the reflective stitching throughout the harness. This is vital if you walk your dog at night, especially where there may be traffic. If you let them off the leash to run, it also helps you keep an eye on where they are. Presumably, you prefer products that last, so you will be pleased to know the materials used to make this one are not only very durable, but are also washable. This lets you wash the harness to keep it clean, fresh, and ready for your dog to look its best on their next walk. Five Point of Adjustment - The Dog Harness have 5 points of adjustment which allow you to create a customizable snug , enable the dog to have full range of motion. With metal material avoid fall off and ensure the stability. Fashion & Practical Handle - Our harness with plastic handle is strength enough to raise up the large breeds.You can help your dog up and over the obstacles,which is a great collar alternative and ideal for hiking, scrambling, and mobility assistance. Material & Structure - The surface is made of high intensity polyester which is lightweight,non-toxic,durable & washable.The underneath is the mesh material which is breathable,skin-friendly,soft & comfortable to wear.And the sturdy fabric with soft edges is invoid to chafe the doggie's body,and is also reflective which allows your pet to walk safely in the night. Foam Padded & Leg Loops - The harness vest padded belly support and leg loops provide controllable, comfortable, and balanced lifting with good load dispersion. The leg loops can be stowed for increased mobility during approach. 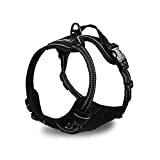 Dog Harness Size - The Web Harness is available in 2 sizes (show as sizing chart). Medium: 20-28 inches ; Large: 22-32 inches. Choose the correct size based on your dog's girth (measuring around the widest part of the rib cage).Suggest 21-26 inch choose Medium.27-32 inch choose Large. Chafing is an issue that can be annoying at one end of the scale and cause serious and painful skin problems at the other. This should not be an issue with this harness thanks to its soft edge material. Although there is stitching throughout, and much of it reflective, there is not enough. Instead, a lot of glue has been used which is not our preferred means of holding products worn by dogs together. 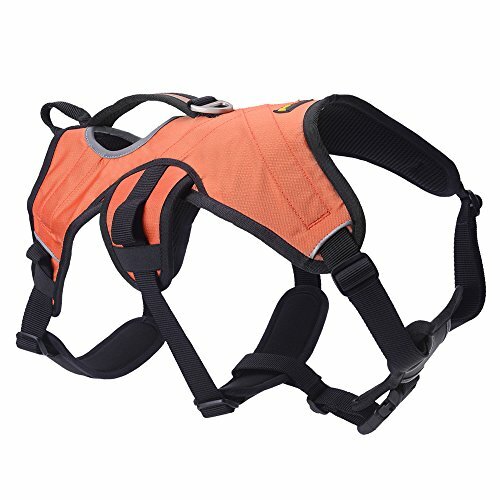 If you are looking for an escape-proof dog harness which allows you the maximum means of adjustment so it fits properly and comfortably, then this could be the one. It has four adjustable buckles, so you can adjust it in several ways to get it fitting just right. There are some harnesses the design of which is so wrong that they can even cause a risk of choking the dog wearing it. That is certainly not the case with this harness which is specifically configured so that there is no danger whatsoever of any choking hazard to your dog. This means if your dog tries to pull, as you resist them, the pressure will be on their chest and not their neck or throat. Speaking of pulling, if this is an issue or you simply have a very strong dog, you can use either or both leash clip rings to secure a leash to the harness. There is one on the back, which is the most likely one you'll use, but if you do need a second, it is located at the front of the harness. A handle on the back can also be used to hold your dog back when they are off the leash. One of the best ways to prevent your dog from misbehaving or trying to escape when they are walking is to ensure that the harness they are wearing is comfortable. After all, you are hardly going to feel at your best if what you are wearing is chafing you, or way too tight and digging into your sides. To make your dog as comfortable as possible, first ensure that you use the four adjustable buckles so that it fits snuggly and doesn't move about too much, without being too tight. Once that is achieved, thick padding in the main chest area will reduce any chances of your dog feeling any irritation in front. 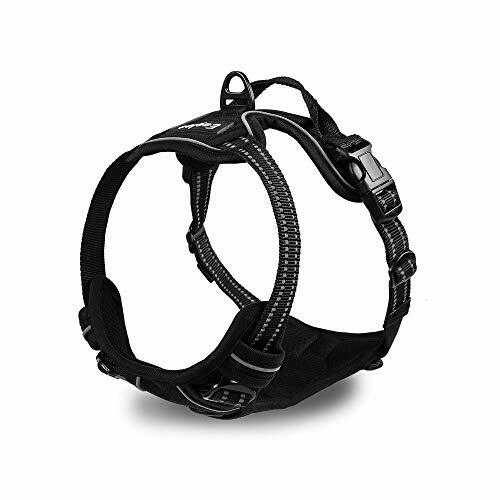 This harness has more size options than many others, which go from extra-small to extra-large. If you have a very small dog, this might be one of the few harnesses that have a size you can use. Most of the larger stitching is reflective which should help with safety in the dark, but unfortunately, it is not very visible. As with all dog harnesses we review, one of the first things we want to establish is how comfortable it will be. This Ruffwear harness passed that check with ease, thanks to its padded straps which are ideal for long walks, and multiple points of adjustment. We mentioned comfort in the introduction, so let's look closer at that element of this harness. The padded straps are a great idea in terms of helping to make your dog more comfortable, and many other harnesses do not have this feature, so this is a big plus for the Ruffwear harness. Staying with the comfort, we also have no fewer than five different points where you can adjust the harness. This allows you to make sure that all the straps are exactly the right length, and the harness fits snuggly around your dog's body. This way, on both short and long walks, they are not distracted by excess movement or conversely, the harness digging in or chafing them. If any of those walks happen to take place after the sun has gone down, you can relax in the knowledge that you and others will be able to see your dog, due to the reflective trims on the front, side, and rear of this harness. Walking a dog on the leash will undoubtedly be a different experience for every dog owner. If your experience is one where your dog tends to pull or is prone to running after something it sees whilst pulling you along with them, then the next features may help you. These are the leash rings. One ring might be enough to restrain some dogs but often a second is needed, and thankfully this harness has that second ring. This way you can use two leashes to give you that extra leverage to control your dog if they try to pull away. Eventually, they'll realize it is pointless for them to do so and should stop trying to pull you altogether. 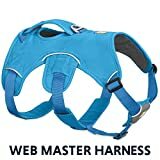 This is a great harness for training puppies to walk on the leash and to not pull when doing so. it can also be used to train older dogs who have not been leash trained properly. The material is not breathable, which does open the slight risk that dogs might get a bit hot. Once you have decided that you need to get an escape proof dog harness for your beloved canine friend (or friends), for lots of reasons it is important that you do not simply choose the one that looks the nicest or has the cheapest price. Doing it that way will cause more problems for you and your dog than it solves. There are several important features which you should be looking for in any harness you buy for your dog so when they are wearing it out walking with you, they are comfortable and safe. How these are achieved may differ from product to product, so it makes sense for you to understand what they are. To help you achieve this we are going to go into detail as to what the main features are, and how you can assess each harness to see if it meets the required criteria. There are two main types of harness which are available. 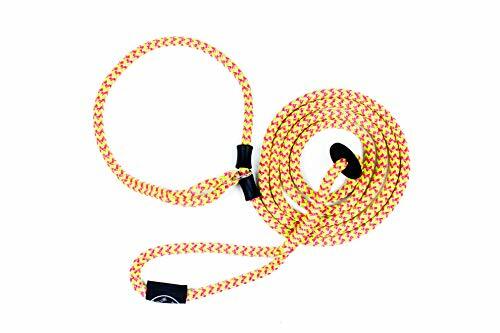 The first type is the harness lead, which, as the name suggests, looks more like a dog leash, or lead. It is a long, thin length of material with loops at either end. You first place a loop over the dog's head and then wrap and adjust the rest of the length so that it forms a safe and secure harness. It sounds a bit complicated at first, but once you have done it a couple of times it won't seem that way. This type is very effective for dogs which pull a lot, and lots of dog owners have used this type to solve that problem. The second type is the type of harness which might get mistaken for a dog coat. It normally has padded material, at the front, with multiple straps and buckles which are adjusted so it fits the dog. Other features can include a handle for owners to hold their dog back when not on the leash, reflective materials or trims for visibility, and often they have two leash rings instead of one, for extra restraining power. Most, though not all, harnesses come in a range of sizes. In truth, there is no standard sizing criteria so what might be called medium by one manufacturer, may not correspond with what another calls medium. This is a problem, as it's crucial that any harness you put on your dog fits them properly. By that, we mean it should be snug, without being too tight, and should not move about too much. One tip is to check customer reviews of the product and see if there are any comments about the size being too small or too large. Once you have the harness and are putting it on your dog, start with it relatively loose, and then adjust the straps gradually until you get it to that snug fit we mentioned. When you are walking your dog, if they seem distracted, or keep pawing and scratching at one part of the harness, check to ensure that area isn't rubbing too hard against their skin. Chafing can occur when a harness is too tight, so you want to avoid that. One other point to note is that some materials may stretch over time, so watch out for any signs that your dog's harness is becoming loose because of this. The durability and strength of the materials used to make the best escape proof dog harnesses are not just a matter of the product lasting a long time. Whilst that is certainly desirable, there are other important reasons you want strong and durable materials to have been used. Number one is the fact that many dog owners buy a harness because what they are using now allows their dog to escape, and possibly run off into all sorts of scenarios, some of which will be dangerous. The whole point of an escape-proof harness is that it is strong enough to prevent a dog, large or small, from escaping. That is hardly going to be the case if the materials are substandard or flimsy. The main areas where strength is needed are the straps and the leash rings, as these are the points that take most of the force. Beyond that, the other materials such as the padding, the stitching, and reflective trims, for example, should be no less durable, in terms of the harness lasting a reasonable amount of time. The quality of any product is not just a matter of how good the materials are that were used to make it. The workmanship is also a big factor, as is whether or not the product does what it is designed to do. This third element is one which is often overlooked. A product made from the highest quality materials and manufactured with exceptional workmanship is worthless if it doesn't work or function properly. It's hardly a quality product then, is it? Use the harness as instructed in terms of putting it on your dog, adjusting it, and then taking them for walks. A quality harness will endure a dog pulling, especially at the leash rings, the straps, and the buckles. As with any product you buy, there could be a problem or even a flaw, but all the harnesses we've reviewed have warranties or guarantees. It is highly unlikely this would be the case if they were poor quality products. The materials listed for them all appear to meet a high standard and there is no evidence of poor workmanship--just like indestructible dog toys. If you are unfortunate enough to encounter a problem, contact the vendor, whose guarantee should ensure you receive a replacement. The same goes for escape proof dog crates. The best harnesses use materials such as double braided nylon which has a tensile strength of up to 3700 lbs., in the case of the harness lead. No dog should be able to escape from that. Other harness types may use high-intensity polyester which is strong, durable, and washable which prolongs the life of the harness. One type of material that is very desirable, although you will not find it on every harness, is that which is breathable. This helps heat to escape and prevents dogs from getting too hot as a result of wearing the harness. You also need to check out what has been used for attachments like the leash rings. Preferably they should be metal and made from aluminum or zinc alloy to ensure they can hold even the most forceful of dogs. Buckles tend to be plastic, although you may find some which are metal. Whichever it is, they are designed to withstand the harness being fitted and removed several times a day, as not all dog owners leave the harness on their dog all day long. For visibility, there will be a reflective material which, depending on the specific harness, could be the stitching, the main harness, or trims which are located across the exterior of the harness. You want to buy the correct size for your dog first. Assuming you have, get your dog to stand next to you. If they have never worn a harness before, they may be a bit resistant at first, so use calming words. Place the harness on the floor and then lift it up so it is touching your dog's belly and chest. Bring the straps around and clip the buckles at the rear, then do the same for the front. Always check how well it fits, and if it is too tight or too loose, adjust the straps accordingly. Harnesses can be worn by dogs, simply for them to be taken on a normal walk. For dogs which tend to pull, they make it easier for owners to control them and help make the dog realize that pulling is getting them nowhere. Harnesses also tend to be a safer way to correct dogs than yanking a leash attached to their collar, which can cause them to have neck injuries. Depending on the make, there will be a certain number of adjustable buckles. With many harnesses, there are likely to be four or five of them. Having decided that you need to tighten the harness, move the buckle along the strap so that the strap gets shorter. Try to adjust each side the same amount so that it fits evenly across your dog's belly and chest. Never over-tighten a harness as this is not only uncomfortable, but can also lead to irritation on your dog's skin. Yes, you can, if you can find one small enough to fit it properly, albeit for larger breeds this should not be an issue. For training, a harness is preferable to a collar which, if pulled too hard, can hurt a young puppy's neck. A harness will quickly help to teach a puppy not to pull. It shouldn't, if the harness has been fitted correctly. If the harness is too tight there could be a problem as air cannot circulate beneath it. Some harnesses use a breathable material which helps dogs to stay cool. There are many reasons why you might be thinking about buying an escape proof harness for your dog. An obvious reason might be that they escape from the one they currently wear. You could also be looking for a way to train your dog to stop pulling, or it might be that you are concerned about injuring your dog's neck, if all they wear is a collar and you need to correct them in any way. Whatever the reason, we hope you have found our reviews and the supplemental information useful, and that you feel more confident about selecting an escape proof harness for your dog as a result. We did say we would pick our top choice, so our best escape proof dog harness is the Homein No Pull Dog Harness. The reason we chose it is because it has all the features that any dog owner should want on their dog's harness, and the quality is also very good. For a start, it has thick padding in the chest and belly area so that will help to keep your dog comfortable and this is further enhanced by the four adjustable buckles to help you get a nice snug fit. To assist owners in keeping their dog under control, there is a stitched handle on the back, plus it has two leash clip rings; one on the front and one on the back, so that two leashes can be used at the same time. The final reason for choosing the Homein harness is the great value for money it offers. It is currently less than $20 which is a great price for an escape proof dog harness and confirms it as our #1 recommendation.